To make a lamp of this type is relatively simple and we may already have all the materials at home. Bend steel wire so that attaches over the pot between inward and be able to hold the candle wick. Fold the other end of the wire in a spiral around the fuse, so the fuse can sustain vertical(like candles). Make the spiral form a kind of pyramid, which serves as the bottom support. 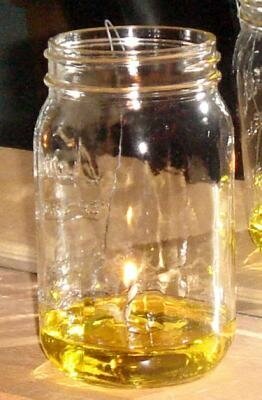 About thirty grams of olive oil can last an hour or more, the cost is not higher than candles. But you can buy olive oil that is unfit for human consumption but to burn, and is cheaper. You can boil the olive oil with essential oils for combustion give off a pleasant smell. The olive oil lamps have been used for thousands of years, and oil lamps in general have been used in a few generations ago. They are reliable, have great power and last much. The benefit of olive oil lamps is that if dumped, left to burn, since there is a highly flammable material. They are much safer than other lighting options by combustion. One benefit of using a glass jar is that you can shut down and stored when not in use. For the match, you can use a cotton string. To be more durable, is introduced into a jar with salt water, letting it dry afterwards. You can also buy braided wick, or use an old towel to create a wick.